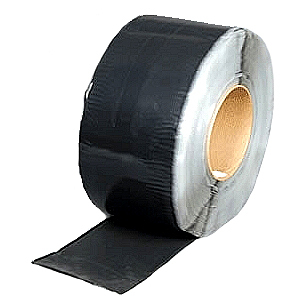 APPLICATIONS: EPDM coverstrip is a heavy duty, very strong, EPDM seam and repair tape. Suitable for ABOVE OR BELOW GRADE (UV exposure or submersion applications). DESCRIPTION: BLACK Peel & Stick Cured Coverstrip is a nominal 30-mil (0.75 mm) thick black color cured EPDM membrane laminated to 35-mil (0.89 mm) thick synthetic rubber peel and stick bonding adhesive. Clean and Prime EPDM surfaces (use EPDM "MULTIPURPOSE" primer).